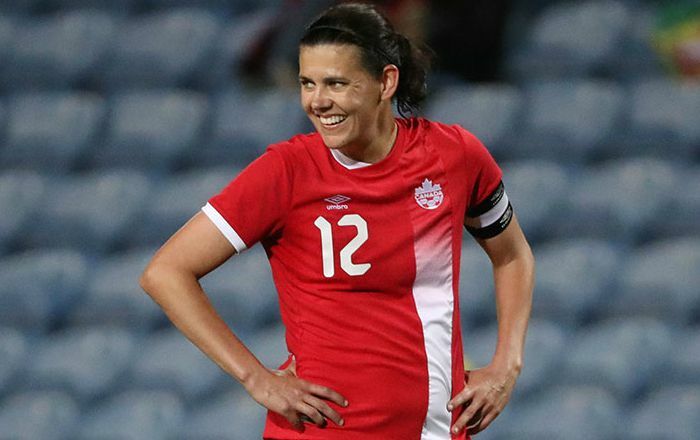 Canadian soccer player Christine Sinclair who is two-time Olympic bronze medalist and twelve-time recipient of the Canada Soccer Player of the Year award. She plays for the Portland Thorns FC in the National Women’s Soccer League (NWSL) and has won several championships. She was inducted into the Canada’s Walk of Fame and also won the Lou Marsh Trophy as Canada’s athlete of the year, and the Bobbie Rosenfeld Award as Canada’s female athlete of the year. Christine Sinclair was born on 12 June 1983, in Burnaby, British Columbia, Canada. She’s currently 35 years old. Sinclair attended Burnaby South Secondary School and graduated from the University of Portland in 2005. Christine Sinclair has kept her personal life discreet from his professional life and thus there is not much information available of any relation she has had in the past or in the present. Her vital stats are unknown. In 2012, she appeared in an episode of The Difference Makers with Rick Hansen. In May 2015, she was featured in the TSN documentary, RISE, along with the rest of the Canadian national team. Christine has appeared in television commercial for Coco-Cola. There’s no information on Christine’s net worth available right now. Christine began playing soccer at the age of four for an under-7 team. Sinclair is a fast, well-rounded, physically strong, and intelligent forward, known for her ball skills, athleticism, technique, and field vision. She is the niece of former North American Soccer League players Bruce and Brian Gant. Sinclair was appeared on the covers of The Walrus, Sportsnet Magazine, Ottawa Life Magazine, FACES Magazine and Canadian Business. Sinclair was featured on the Canadian version of EA Sports’ FIFA 16 (2016) video game. She’s regarded as Canada’s greatest soccer player of all time and as one of the greatest ever women soccer players. Sinclair has won four professional championships with three different teams: the 2010 WPS Championship with FC Gold Pride, the 2011 WPS Championship with Western New York Flash, and the 2013 and 2017 NWSL Championships with Portland Thorns FC. In 2002, she was awarded the Golden Boot for most goals scored and the Golden Ball as the best player at the FIFA U-19 Women’s World Championship. She was named Canadian Player of the Year 13 times between 2000 and 2016. In 2012, she won the Lou Marsh Trophy as Canada’s athlete of the year, and the Bobbie Rosenfeld Award as Canada’s female athlete of the year. In 2012, she was named Athlete of the Year by Sportsnet. The same year, she also received an honorary degree from Simon Fraser University. In June 2017, she was appointed an Officer of the Order of Canada by Governor General David Johnston.